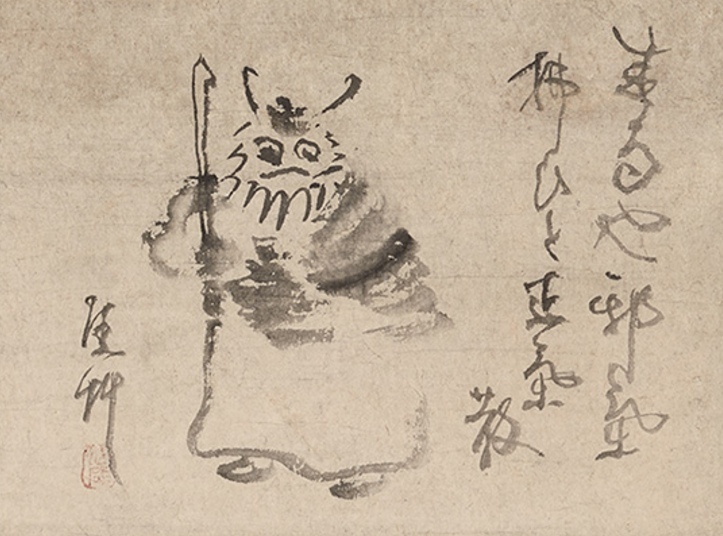 SAN FRANCISCO — “When Pictures Speak: The Written Word in Japanese Art” closes Sunday, Aug. 19, at the Japanese Galleries at the Asian Art Museum/Chong-Moon Lee Center for Asian Art & Culture, 200 Larkin St. in San Francisco’s Civic Center. Words and pictures are often combined in Japanese art, to celebrate poems and stories, express religious teachings, and comment on current events. Though not unique to Japan, the marriage of text and image has flourished there, finding relevance within each new generation of artists, writers, and patrons. The paintings in “When Pictures Speak” show the great historical and thematic range of this practice. The largest group of works consists of pictures with texts from secular literature, especially Japanese poems (waka) in the style favored at the imperial court. Religious works are represented by ink paintings inscribed by Zen monks, narrative scrolls (emaki), and iconographic drawings (zuzo). The selections also include two examples of text and image in satire. More than literal transcriptions of a story, pictures can amplify the meaning of a text with newly invented details or change the tone through stylistic means (for example, the choice of bold color versus sparse strokes of ink). Similarly, inscriptions can complement the visual, adding not just stories or imagery, but also sensory elements like sound to the experience of looking. Calligraphic styles add their voices to the mix, as when dancing, rhythmic strokes are used for poems, or a more stately, formal style for an iconographic manual. The Japanese collection is second in size only to Chinese among the museum’s collections. Its 5,500 Japanese art works, including ceramics, baskets, paintings, and prints, range from as early as 3000 BCE to the 21st century. Hours: Tuesday through Sunday, 10 a.m. to 5 p.m.; Thursday, 10 a.m. to 9 p.m.; closed Monday. Admission is $10-$15 general, free for children under 12 and members. For more information, call (415) 581-3500 or visit www.asianart.org.